High School: Unadilla Valley C.S.D. When I was first looking for an undergraduate program to enroll in that would best prepare me for a career in legal services, I contacted Professor Margaret Phillips, Program Director of the Paralegal Studies Program at Daemen. Her genuine outreach, support, and promise in Daemen’s commitment to learning were the reasons that I chose Daemen. Paralegal Studies is a dynamic program that provides training in critical thinking, argument, legal research, and writing. Daemen’s program is supported by distinguished legal professionals and educators whose knowledge and experience is shared and fostered in students. The program’s concentration in research and writing has provided me the skills necessary to gain legal experience in various capacities. I am currently a legal intern at the Center for Elder Law and Justice, and independently engaged with legislative policy research for the Office of Senator Tim Kennedy, in areas of long term care. 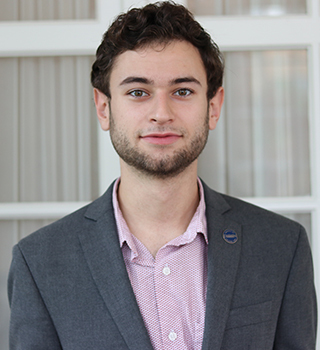 Daemen has led me to experiential opportunities and continues to support my mission to work in legal advocacy. The impact of President Gary A. Olson is one that I feel honored to carry with me, as I plan to graduate in May, 2019. I have worked as a Student Assistant in the Office of the President since my sophomore year, and shortly after, became a Personal Assistant to the President, as well. President Olson has taught me innumerable lessons in professionalism, ethics, hard work, and how to think critically. His never-to-cease commitment to Daemen and his dedication to the further-development and success of the college is inspiring. My service learning experience introduced me to the Young-Adult-Life-Transitions Program sponsored by People, Inc. The program’s mission is to provide on-campus college experience to young adults with developmental disabilities, while helping to develop functional and social skills. The young adults that I had the pleasure of working with are, still, the smiling faces on campus that I look forward to seeing the most every week. You will find me on the back patio of Wick with Terrence, my dog / best friend.